Mobile GIS field collection is finally here and UK FIS is fully leveraging this powerful technology. In the past 1.5 years since deployment, we’ve seen significant ROI that has made this leap well worth the investment. From waste container locations to impervious mapping for landscape management, the mapping options are truly unlimited. 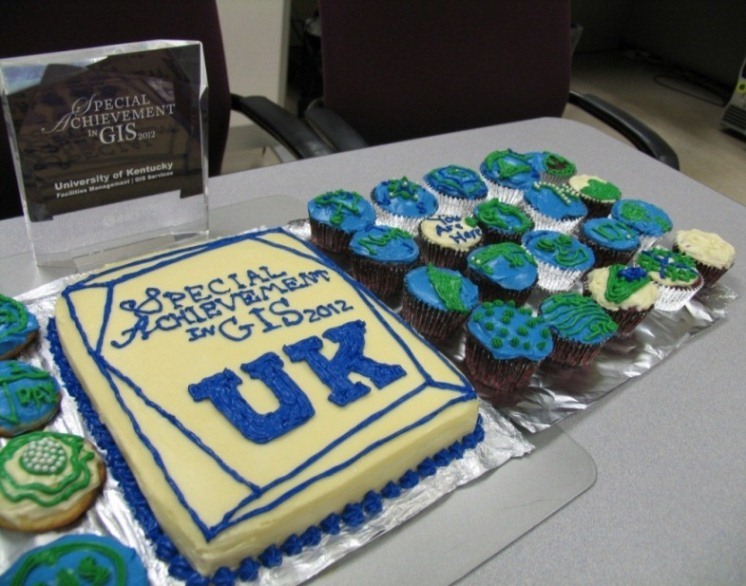 The completion of a campus-wide accessibility mapping initiative was the inspiration for the 2016 GIS Day cake design. The project was a collaboration between multiple university areas, was performed by student surveyors, and came to life through ArcGIS networking tools. Now those in need can use the Official UK Campus Map to route across campus on accessible paths that omit stairs and route to ADA doors. All with a click of a check box. After five years of dedicated work we have audited, standardized, and laser measured 56 buildings totaling 18 million square feet. Our data originally matched only 30% across systems and our end goal is 100% across all systems and data libraries (1:1 accuracy). This year we finished processing 130 buildings (out of 400) to enterprise GIS and last week our match rate was 99.4% between GIS and the UK space system. Not only is the data right but we’ve built relationships with renovation areas and space management to ensure campus construction is being reported and the data is being recorded. Our 2014 sweet cream creation was inspired by completion of the “Space Revitalization Project”. In just over four years, FIS audited 400 campus buildings, physically went inside of 50k rooms, and updated the digital floor plans to updated, accurate information and standardized the files for system integration. This effort also included Laser Measuring 56 buildings and processing 18 million sqft of tabular data for upload to SAP, the UK enterprise resource planning system. If only completing this effort was as easy as baking this case was! Do the words “enterprise database design” tempt you? If not, then you’ve never eaten one in cake form. 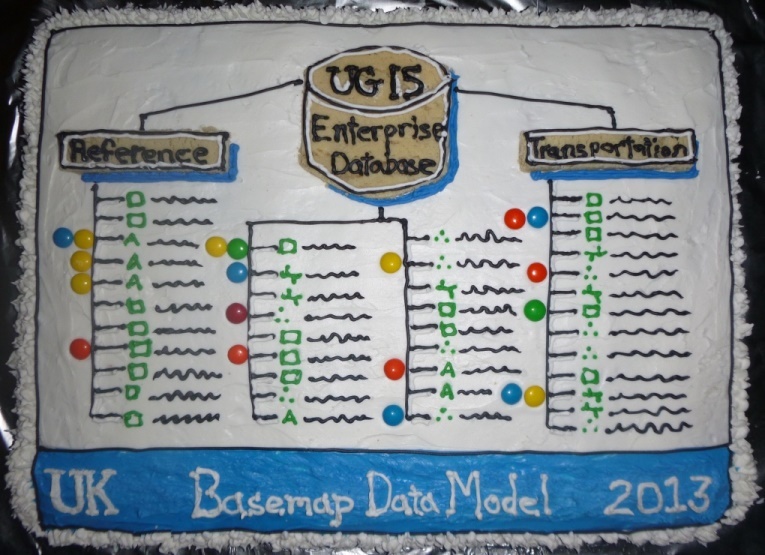 Made of cookies, cake, frosting, and M&Ms, this year’s cake represented the completion of our multi-year effort to develop a thoughtful and sustainable base map database design to lay the foundation for future growth (see diagram here). Future plans include licorice routing, spatial candy networks, and rice krispy representations. Above average ROI and departmental expansion is expected. 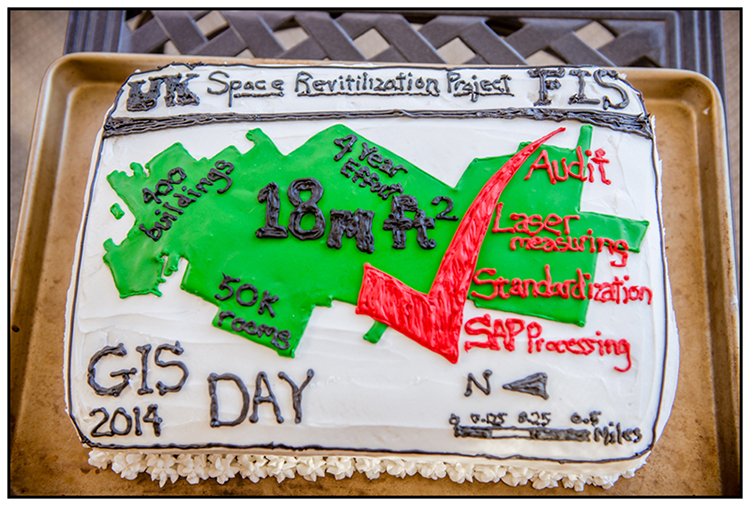 What’s in the GIS Day cake for 2012? This year’s delectable treat consisted of vanilla cake, chocolate chips, buttercream frosting, trimmed with blue icing in the shape of an Esri Special Achievement in GIS Award (SAG). This international award was presented to UK Facilities Management at the 2012 Esri User Conference (read more here). If cake wasn’t enough to honor the big day, the GIS Services team geo-located creatively decorated cupcakes and cookies to target unsuspecting office workers’ taste buds. Results proved successful as a trail of blue crumbs could be seen routing down office corridors. To run the software we all like. Although now legacy, worked out quite well. 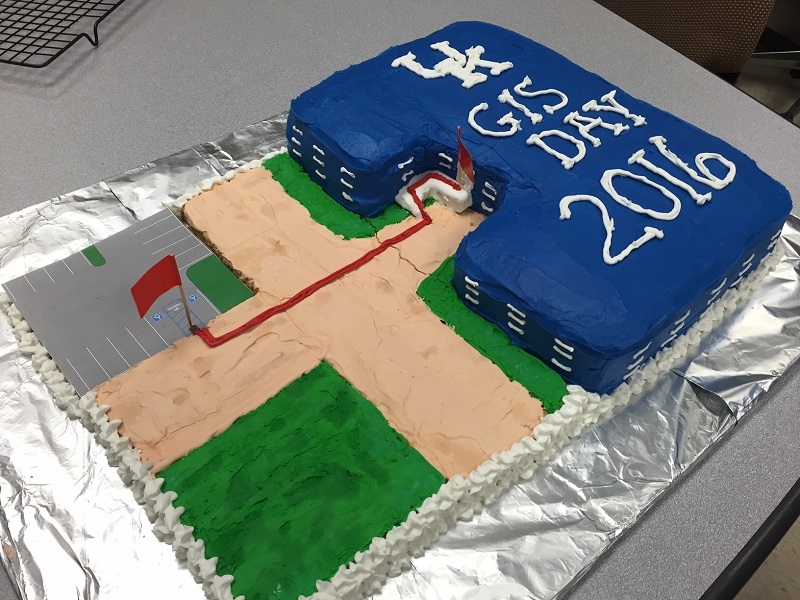 This year, the University of Kentucky Facilities Management made a GIS Day cake in loving memory of the “ dongle”, the hardware key used to run Esri software which has recently been eliminated by the release of v10 ArcGIS Desktop software. 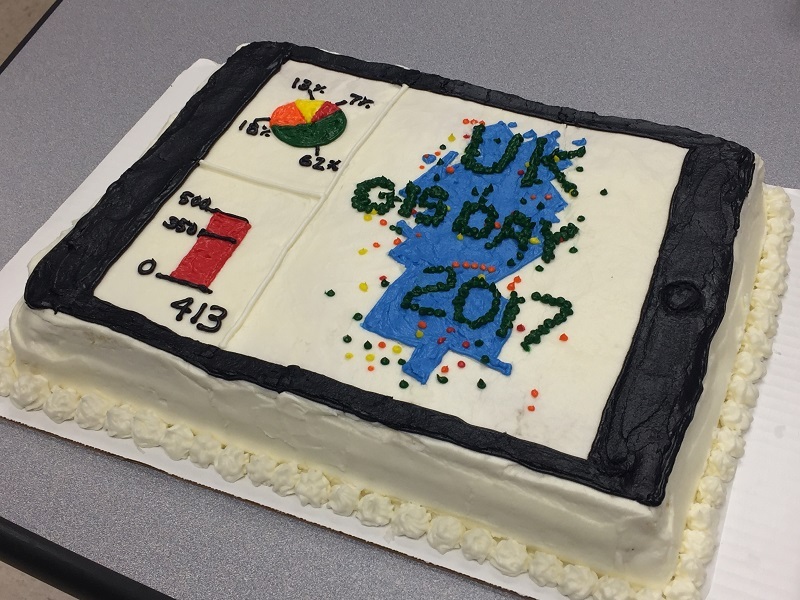 This cake was part of a regional GIS Day event held on the UK campus. 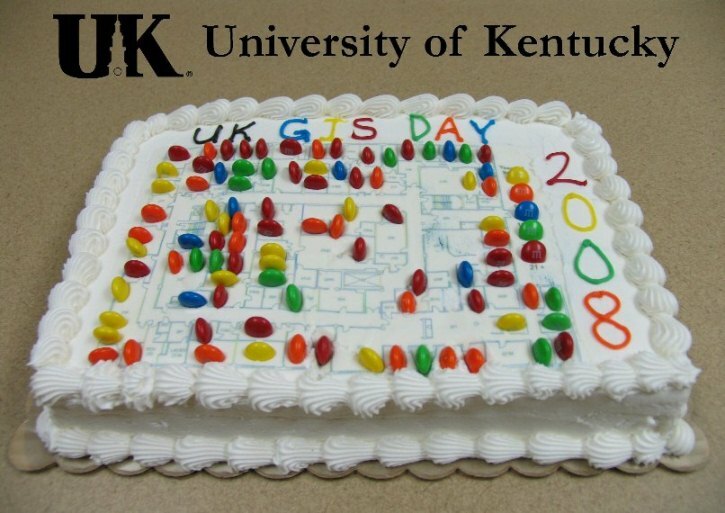 University of Kentucky Facilities Management celebrated GIS Day 2010 with a tasty rendition of their award-winning custom GIS Facility Management Application. 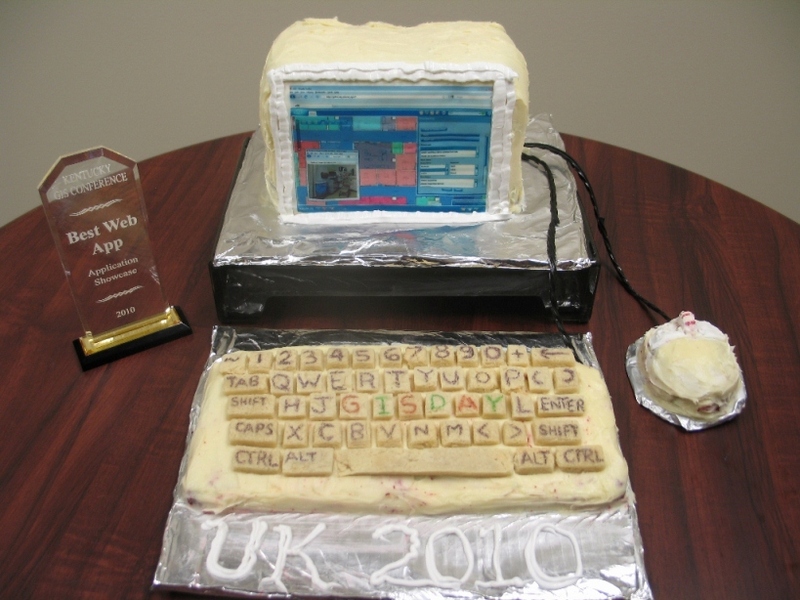 Unlike the actual application that integrates CAD, GIS, 360 photos, and University systems, this edible workstation whipped together cookies, licorice, and cake for a one-click treat. With beta testing behind us, our integrated circuits of sugary delights are ready for the Food Network Challenge! 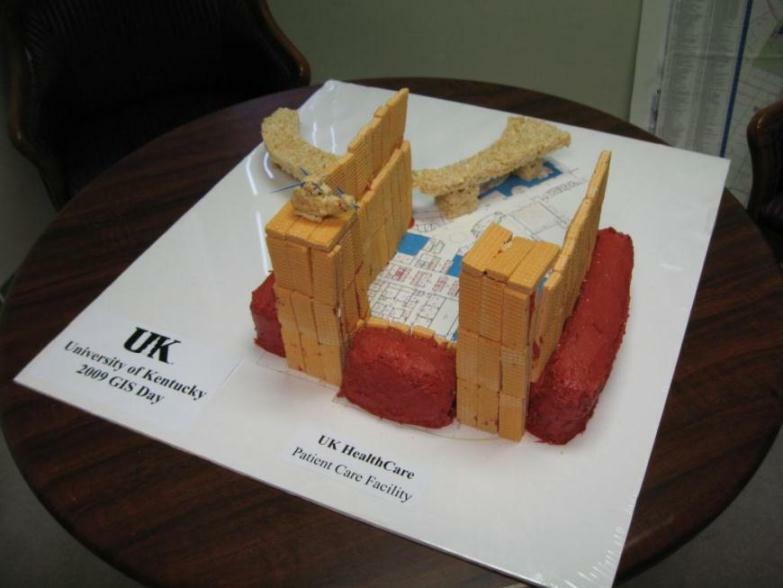 This year at the University of Kentucky Facilities Management, our geo-bakers' rendition of the new hospital literally "takes the cake"! Constructed of cake, sugar wafers, and rice krispy treats, this 8" tall colossal, edible rendition of the hospital was built around a plot of our GIS floor plan interior space management application and celebrates our biggest GIS project to date. Unlike the real construction of this facility, our edible hospital was way over budget and took longer than expected, in part due to construction materials being consumed at the job site. The back is a pedway made of rice krispy treats and there is even a helicopter on the rooftop! 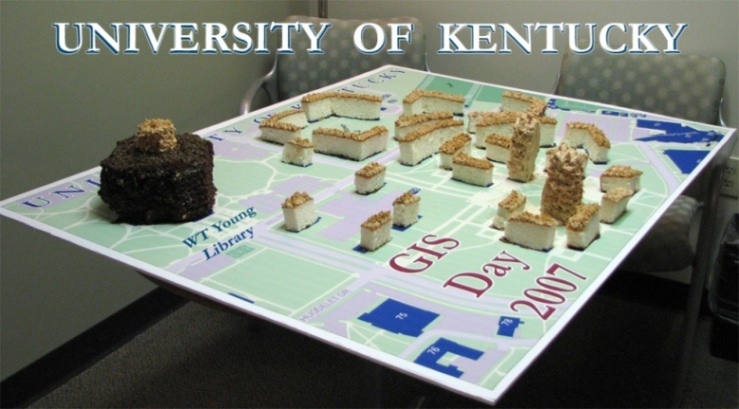 The University of Kentucky Facilities Management celebrated GIS Day 2008 by promoting its new type of cartographic output with its CAD-to-CAKE conversion efforts. Post CAD-to-CAKE, geostatistical analysis was performed by employees mapping their years of service on a sugary floor plan layout. Five edible categories symbolized years of service to UK with seasoned employees dominating early arrival times and window offices. Floor plan analysis never tasted so sweet with the results offering proof that M&Ms melt in your mouth, not in your hands. 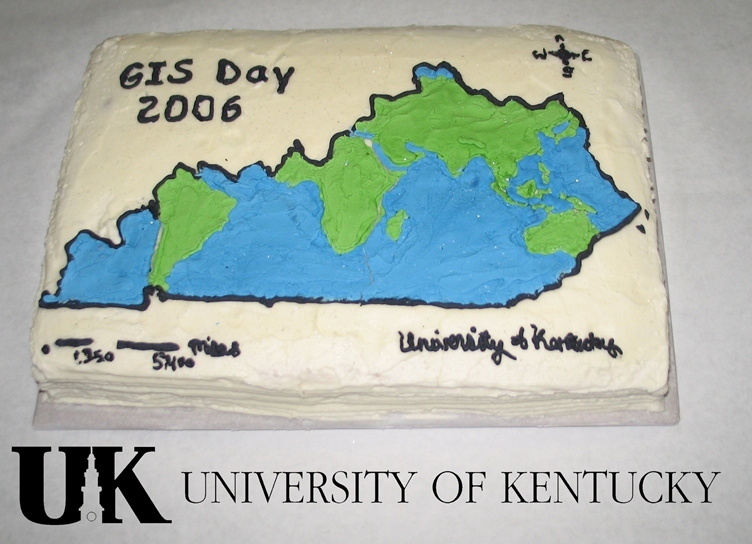 The University of Kentucky Facilities Management celebrated GIS Day 2007 by bringing back 'geo-baker' Katherine Loving for another GIS Day cake, this time with an eye toward the third dimension. The 1"=50' scale E-size map comprised a portion of UK's main campus with 27 edible structures . Attendees laughed about eating their former dorm residences, and some commented that if UK's library was really made of chocolate, students might spend more time there! Administration reported building maintenance costs were going down with every bite. 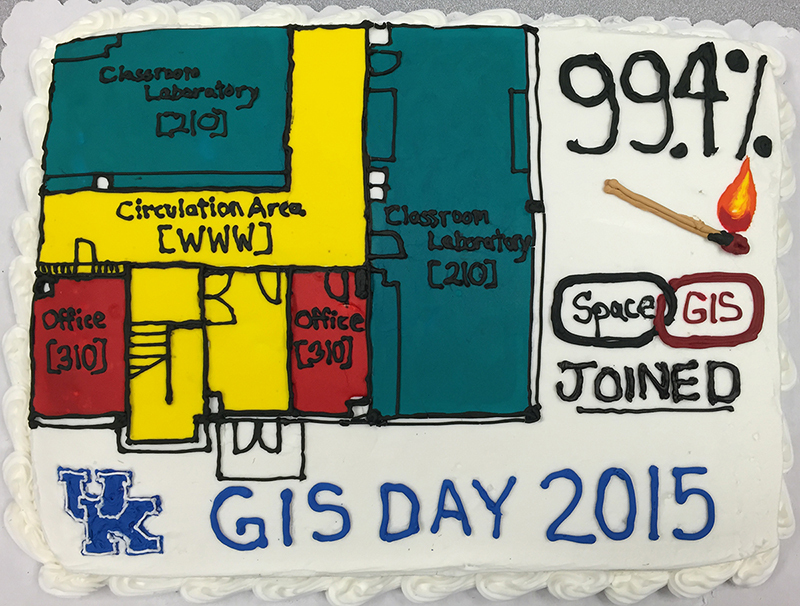 The University of Kentucky Facilities Management celebrated GIS Day with a campus-wide GIS Day event held at Barker Hall where 11 UK areas showcased their GIS usage. 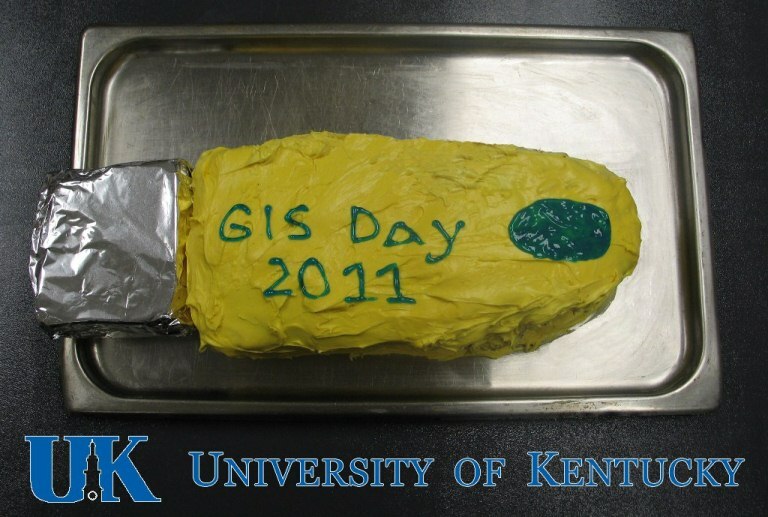 This GIS Day cake was made by UK student, Katherine Loving, and was designed in GIS so the units are to scale!